If you follow any Christian blogs, you’ll know that what many of them enjoy most is slagging off other brands of Christianity. They take the odd swipe at the heathen and at gay people, of course, but most of their bile is reserved for each other. They dispute the smallest matters of doctrine and principle that they are sure other groups of believers haven’t got quite as right as they have. To the outsider, it’s like arguing about whether the tooth fairy’s dress is pink or green while overlooking the fact that there is no tooth fairy. It’s curious too because there are more similarities than differences between the varieties of Christianity. They have much more in common with each other than with the rest of us. Most significantly, they all believe in supernatural beings. This, for me, is the greatest difference between myself and those who profess a faith. I see no evidence for supernatural creatures, places or events. The supernatural has no independent existence outside the human imagination. It is the human mind that, over the millennia, has constructed innumerable gods and their attendant mythologies, just as it has created more recently the inhabitants of Narnia, Middle-Earth and Hogwarts. While believers are adamant that there’s one God, they insist at the same time he is made up of three individuals: a Father, a Son and a Holy Spirit. They believe in angels who wait upon God the Father in Heaven – a supernatural place they mistakenly believe they’ll be going to when they die – and who, some maintain, aid them here on Earth. How many angels are there? We are told in the Bible there’s a ‘host’ of them, which sounds like quite a lot. There are also seraphim (Isaiah 6.2) and cherubim (Hebrew 9.5 etc), third-rate special-effects creatures who act as God’s heavies. In addition to them, there are characters from the early days of Judaism – Moses and Elijah – who have survived death and hang about somewhere or other. They make a surprise return visit to Earth in Matthew 17.3. For some, Jesus’ mother, Mary, is another of this elite group of Eternals. And what about all of the ordinary believers Christians say have already gone to Heaven? That’s millions of dead people who enjoy supernatural existence. Roman Catholics even believe you can chat with these heavenly ‘saints’ and they’ll argue your case for you with the Big Boss. There’s the cast of characters from the dark-side too: God’s nemesis the Devil (aka Satan, aka Lucifer – though confusingly this last title is also used of Christ in Revelation 22.16) and his armies of demons and evil spirits who have nothing better to do than take over gullible human minds. This lot live in another supernatural place, Hell, though no-one seems to know where this is either (in Luke 10.15, Jesus implies it’s inside the earth, but it isn’t). And last but not least are the supernatural events that supposedly took place in the real world: talking animals (Genesis 3.1; Numbers 22.28), sticks that turn into snakes (Exodus 4.3), corpses rising from graves (Matthew 27.52) and a man who magically beams up to Heaven (Luke 24.51), to name but a few. So, Christians, argue all you like about what makes your version of Christianity better than others, but don’t forget all varieties of the faith depend on believing that these supernatural characters and events are real. In fact, they’re no more real than the pantheon of Greek gods and goddesses who inhabited Olympus, and at least they were interesting. 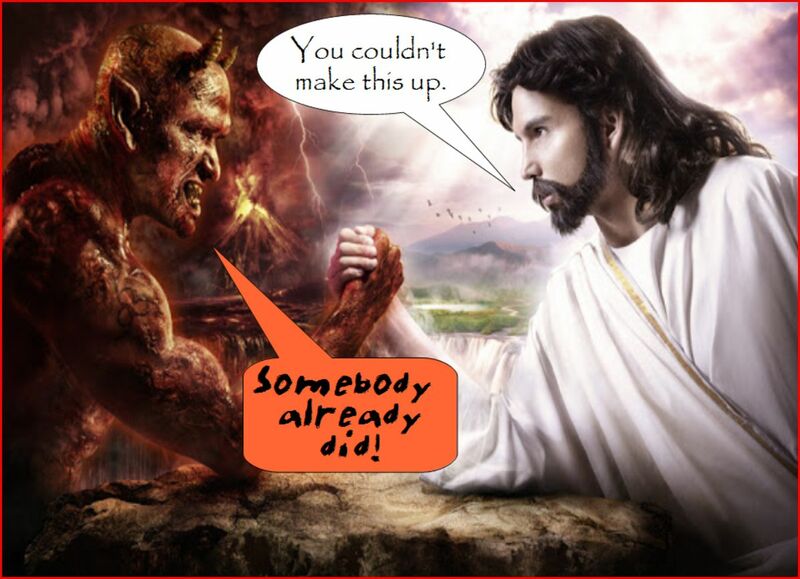 This entry was posted in Christianity's failure to deliver, The impossibility of faith and tagged Angels, Catholic Church, Christian in-fighting, Devil, God, Heaven, Hell, Holy Spirit, Jesus, Mary, Satan, Supernatural beings, Supernatural events by Neil. Bookmark the permalink.